Six-channel mixer for modular synth systems. 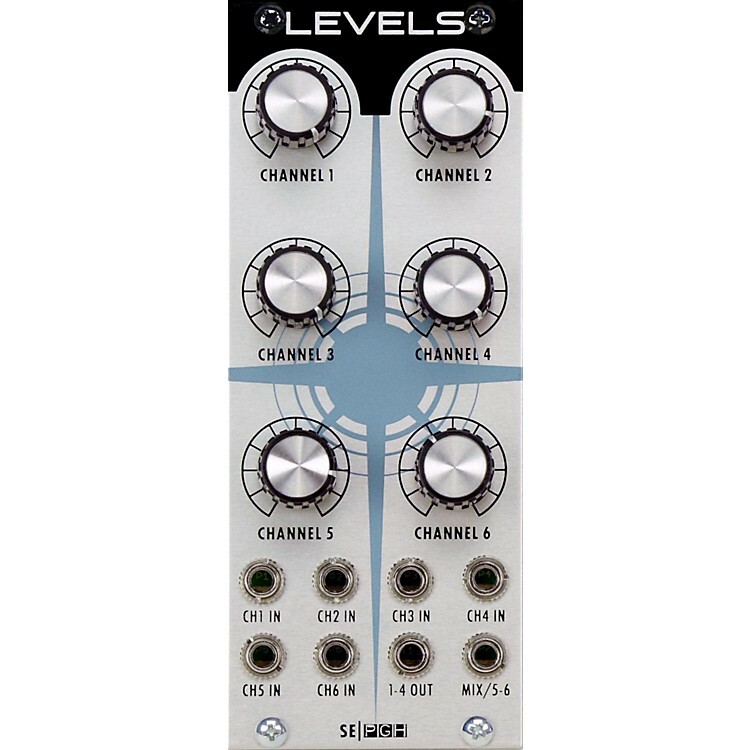 LEVELS is a versatile, low-noise six channel summing mixer/attenuator for audio and CV that can be used in a variety of ways: 6 in 1 out, or two separate mixers: 4 in 1 out, and 2 in 1 out, e. g., when only jacked-in to MIX 5/6 output all input channels pass through; utilizing the 1-4 OUT removes channels 1-4 from the MIX 5/6 output. The pots are wired with a logarithmic volume curve that is tuned for use with audio but it will work with CV as well. Pressing LEVELS into service as a wave-shaper by patching all of the individual OSCILLATION waveform outs (sub, sine, tri, saw, ramp, square) into CHANNEL inputs 1-6, makes for vivid shapes—a morphable hybrid waveform of your sound designs. Six attenuation pots control CHANNEL 1, CHANNEL 2, CHANNEL 3, CHANNEL 4, CHANNEL 5, and CHANNEL 6. CH 6 IN, 1-4 OUT, MIX/5-6. CHANNEL 1 – Adjusts the level or value of 1. CHANNEL 2 – Adjusts the level or value of 2. CHANNEL 3 – Adjusts the level or value of 3. CHANNEL 4 – Adjusts the level or value of 4. CHANNEL 5 – Adjusts the level or value of 5. CHANNEL 6 – Adjusts the level or value of 6. CH 1 IN – Channel 1 input. CH 2 IN – Channel 2 input. CH 3 IN – Channel 3 input. CH 4 IN – Channel 4 input. CH 5 IN – Channel 5 input. CH 6 IN – Channel 6 input. 1-4 OUT – Channels 1-4 output. MIX/5-6 – All channels output (MIX), or 5-6 when cable is plugged into any of the 1-4 channel inputs.